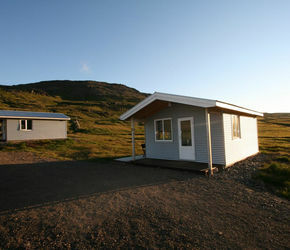 Urðartindur is a family run guesthouse and camping site in Norðurfjörður, in the Icelandic Westfjords. Occupying a stunning position amid fertile farmland at the head of the fjord of the same name, the views are dominated by the mountain Kálfatindar (646m) to the east. Number of walking paths in the neighborhood. Unique and Untouched Nature all around. Unique infinity Swimming Pool just by the Atlantic Ocean. Get away from the tourist traps of Iceland. 2 minutes walk to a Black Sand Beach. Unlimited Free WiFi in all our premises. Are there any facilities for cooking? In the shared space we have a charcoal barbecue, gas barbecue, dishes, cutlery, kitchen stove, pots, tables and chairs where our guests can cook and washing up facilities. What to do in Norðurfjörður? Besides the swimming pool and restaurant there are walking paths and a black sand beach in the surroundings. Many comes to enjoy the peace and quiet in Norðurfjörður. Is Krossneslaug swimming pool close to Norðurfjörður? Krossneslaug swimming pool is only 3 km away from Norðurfjörður. It's important to know that the roads to Norðurfjörður must travel slowly but the surroundings of the roads are beautiful. This place is very remote. There is a restaurant, Kaffi Norðurfjörður, less than 1 km away open from 1st of June to 20th of August every summer. Opening hours from 12 pm to 9 pm. Breakfast can be served upon a request one day in advance.